Thyroid dysfunction is a common problem in pregnancy. Untreated thyroid disease in pregnancy is associated with an increased risk of adverse maternal and fetal outcomes. Thyroid function should be optimised before conception or as early as possible in pregnancy. Guidelines on the treatment of subclinical hypothyroidism in pregnancy have recently been updated to account for new research findings. Women at high risk of thyroid dysfunction should undergo screening with measurement of thyroid stimulating hormone (TSH) levels in early pregnancy. Dietary iodine intake requirements increase in pregnancy and a daily supplement containing 150 mcg of iodine is recommended to avoid iodine insufficiency. 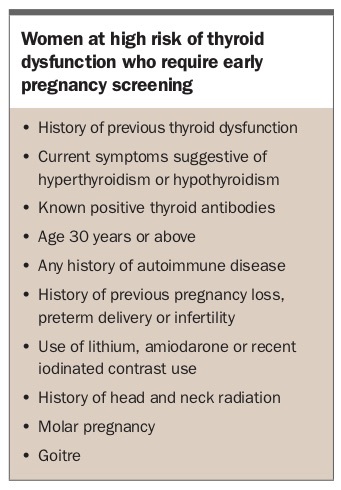 If the TSH level is 2.5 mIU/L or more on early pregnancy screening, levels of thyroid peroxidase antibodies should be measured to identify women who may benefit from treatment for subclinical hypothyroidism. Transient gestational hyperthyroidism is a common cause of mild hyperthyroidism in early pregnancy. Referral of the patient to an endocrinologist is recommended if TSH levels remain persistently undetectable and/or T3 or T4 levels are elevated and/or TSH receptor antibodies (TRAb) are positive. Women with active Graves’ disease or a history of Graves’ disease treated with surgery or radioactive iodine may be at risk of fetal hyperthyroidism. If TRAb level is elevated at 18 to 22 weeks’ gestation, endocrinology and maternal-fetal medicine input are required. The fetus is dependent on maternal thyroxine (T4) in early pregnancy. The maternal thyroid gland is required to increase thyroid hormone synthesis by up to 50% to meet the increased demands of pregnancy due to placental transfer of T4, increased thyroid hormone metabolism, increased renal iodine losses and changes in levels of T4 binding proteins. These changes also affect laboratory thyroid function test assays. Thyroid stimulating hormone (TSH) is the most reliable measure of thyroid function during pregnancy. Pregnancy- and trimester-specific laboratory reference ranges should be used if available. 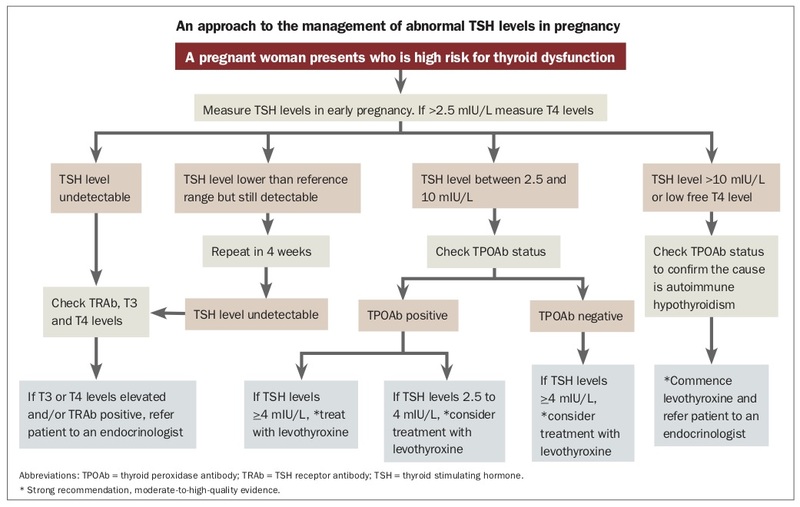 Current studies have not demonstrated a definite benefit from universal screening for thyroid dysfunction during pregnancy.1,2 However, women at high risk of thyroid dysfunction (Box) should have a TSH measurement before conception and as soon as pregnancy is confirmed. Free T4 and thyroid peroxidase antibody (TPOAb) testing should be performed in women with a TSH level greater than 2.5 mIU/L (see Flowchart). Dr Thillainadesan is an Advanced Trainee in Endocrinology and Dr Gargya is Staff Specialist in Endocrinology at Royal Prince Alfred Hospital, Sydney, NSW.